My family has anxiously been awaiting the opening of the new W.W. Ashley playground on Taylor Street East between Lansdowne Avenue and Albert Avenue. Once a bare-bones playground, this new and improved design is one of five "destination accessible" playgrounds in Saskatoon that have incorporated specific design elements that make them accessible to both children and caregivers with disabilities. 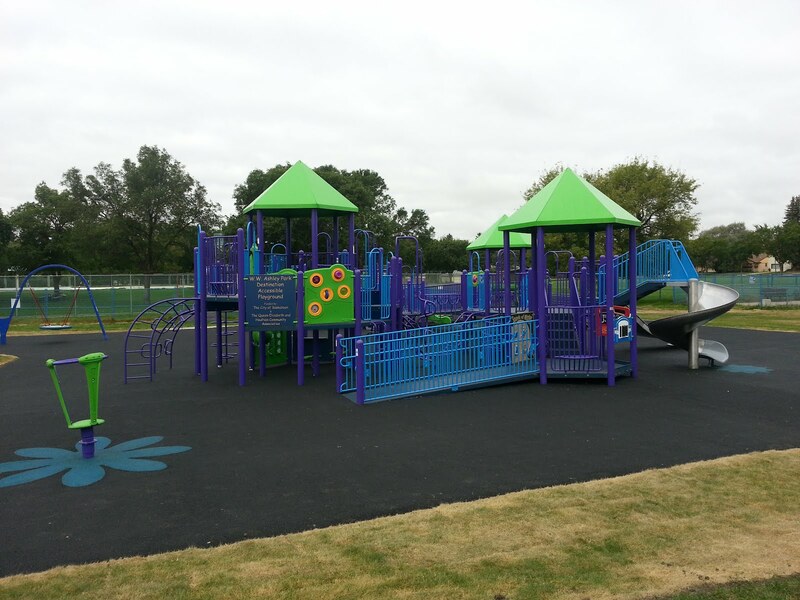 This playground features a rubberized surface as well as ground-level and elevated accessible play components. This park also has a recreation unit, a paddling pool, an open field for sports and a skateboarding area. It is in close proximity to J.S. Wood Library and Lathey Pool. The site opened for play on September 7, 2012. Click below to view a Flickr slideshow of this beautiful new playground. Nice posting! The blue color in to the playground looks amazing and attractive.I would also love to take my kids to such beautiful safety playground.